The view from the bows looking up to the first of the locks to the tunnel and Tuel deep lock. We moved into the basin yesterday to look for water which is not easy to get at here. I do pick some odd neighbours. This looks like a lifeboat off one of the oil rigs. 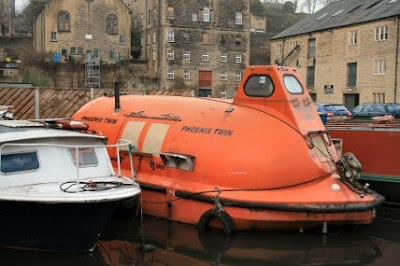 It would give people bit of a shock to see this one coming towards you as you meander your way up the cut. I called in Shire Cruisers to get a new Nicholson guide as mine was out of date and the phone number in there was different to the one on the noticeboard at the first lock. The number in the new book is also out of date with the reorganisation of the BW Regions. The new number is 01782 785 703. Shire Cruisers were as helpful as usual and are happy to order anything you need. The chandlery is rather small and is geared to the holiday market. They do hold the maps, postcards and books on the various rings. They have a nice new HQ in the centre of the basin and sell diesel so took the opportunity of filling up while we are here. 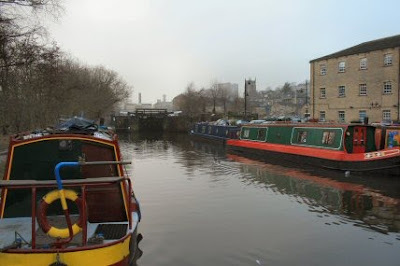 Wandered off into town and found Lidl just the otherside of the deep lock and Tesco the other side of the River Calder. The Engineer pub has in the last day or two reopened with a new landlord. Very friendly but only Thwaites ale. The William IV has been turned into a Gastro-pub but its worth calling in just to use the loo. A pub that doesnt look to have changed since the 19th century is the Turks Head which is down a cawsey and easily missed. Off up the cut tomorrow with the lockkeeper coming to open up at 1000am. 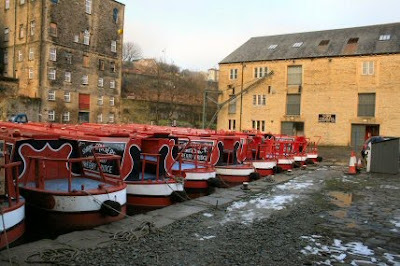 We won't be going far as there is a days trip to Hebden Bridge and a week to do it in.